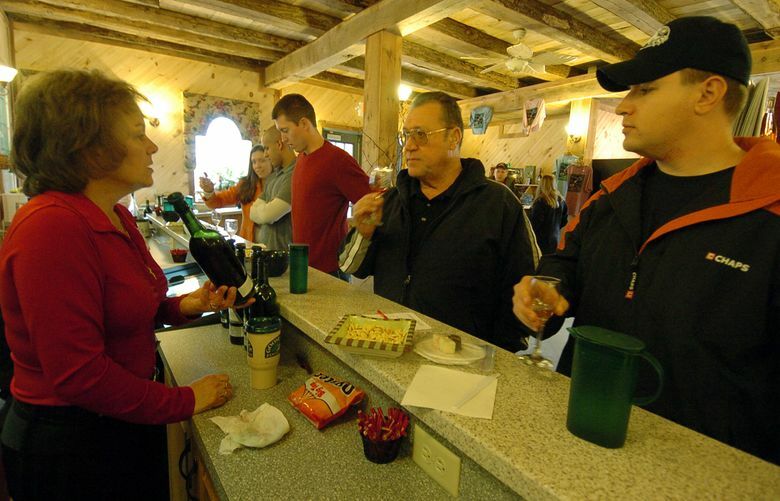 Stanley Robinson, center, and his son John Robinson, right, taste wines with the help of manager Joanne Lachance at the Linganore Winecellars in Mount Airy, Md., in 2006. Industry-wide, tasting-room visits are down at wineries. (Washington Post photo by Ricky Carioti). The wine industry has long salivated over the millennial generation. The problem we're starting to see? Millennials are almost all now of drinking age, but so far at least, they are not becoming wine drinkers. The wine industry is worried, and you, dear consumer (speaking in the global, holistic statistic sense) are the reason. We can chuckle all the way to the bank (do people still go to banks?) as we save money from dropping wine prices. Our search for value is paying dividends. But our drinking habits, as well as our spending, are giving the wine industry fits. Ultimately, that may not be to our benefit, as our buying habits may have the ironic effect of narrowing our options. And wine’s beauty stems to some extent from its diversity. I’m drawing this rather dystopian view from this year’s report on wine market trends published by Silicon Valley Bank. The report is an annual exercise in hand-wringing and navel-gazing that assesses last year’s sales trends and tries to project the future. It’s a tough task for an industry that by its very nature cannot react quickly to adverse trends. But the annual report also gives a fascinating glimpse of how we, as consumers, are enjoying wine – and that, perhaps, is changing faster than the industry can keep up. Let’s start with prices: “As an industry, we’re transitioning to a period of flat to negative volume growth, low sales growth and a modest surplus of grapes, which will put pressure on prices,” the report says. On the surface, the reasons are basic economics: Abundant supply and flattening demand. The latter stems from demographics and increased competition from craft beers, spirits and a newcomer to the report, cannabis. The wine boom from the 1980s through the 2000 decade was fueled by big-spending baby boomers, a generation that increasingly is entering retirement. Gen-Xers have entered their most affluent years, but the industry has long salivated over the larger millennial generation. Millennials are almost all now of drinking age, but so far at least, they are not becoming wine drinkers. “Millennials aren’t engaging with wine as hoped. They lack financial capacity, currently prefer premium spirits and craft beers, and have been slow getting into careers,” the report says. Legal pot is especially popular with younger males, “and that is also likely playing a role in [their] delayed appreciation for wine.” Negative messaging about alcohol’s effect on health is also dampening demand among younger drinkers. It’s hard to say whether any particular trend starts with the pull of consumers or the push of producers, but this year’s report is remarkable for its frequent references to the “thrifty consumer.” Premiumization, the idea that we might buy less but pay more for higher quality, is tapering off as we become more price conscious. This doesn’t mean we are drinking any old swill for the thrill, however. Sales of wine under $9 a bottle are “in clear retreat,” while wines from $9 to $30 continued to post gains in 2018. But even that growth seemed to slow compared with previous years. These new, disparate outlets for wine favor larger distributors who can feed a retail supply chain, creating further pressure for consolidation in the wholesale sector. And many of those wines will be coming from larger producers, further strengthening the seven wineries that produce about 60 percent of all U.S. wines. And that hurts small family-run wineries, which often struggle to place their wines on retail shelves or restaurant lists. In recent years, these wineries have relied on direct-to-consumer sales, which is dependent on people visiting their tasting rooms and then ordering wine for delivery home. But tasting room visits have declined over the past five years in Napa and Sonoma counties, even while tourism is up. Again, the thrifty consumer has an impact. So even while we have more choices of where to buy and enjoy wine, we are increasing pressure that may pinch the range of wines available to choose from. That’s another reason to budget some time and money to support independent retailers and small, family-run wineries, even if we do enjoy an occasional glass of chardonnay while shopping at Bed Bath & Beyond.